As summer is winding down, so are many plants in the Vermont landscape. 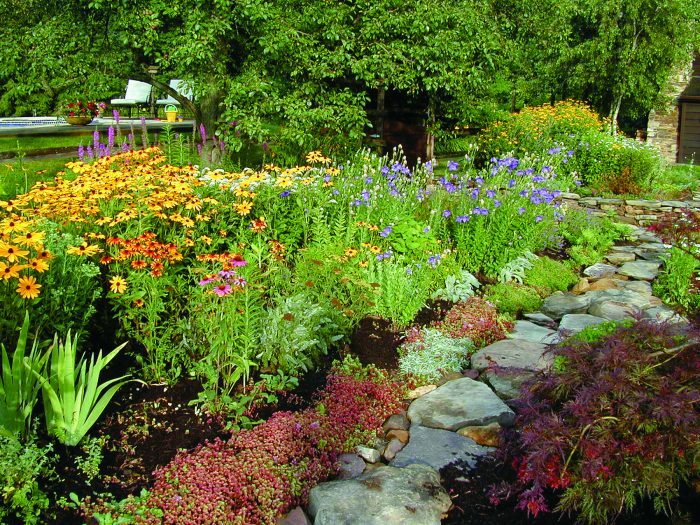 The key to a beautiful backyard garden design is being sure to incorporate plants that have varying bloom times throughout the growing season. You may think that this is easier said than done, but with a little research, a visit to your local garden center or the help of a Landscape Designer, you can have a beautiful garden from early spring to the 1st fall frost. An example of a landscape with varying bloom times would be to incorporate Iris, Cranesbill Geranium, Peonies, Daylily, Black-Eyed Susan and Aster into the garden. The color and interest will be spread from May to October starting with the Iris and Geranium, progressing to the Peony and Daylily, transitioning to the Black-Eyed Susan and then finally the Aster. This is an old fashion perennial that has been seen in Vermont Landscapes for generations. It has whispy grey-green almost lacy foliage. The flowers range in colors from white, yellow, pink and red. This long blooming perennial should be deadheaded when blooms are spent. 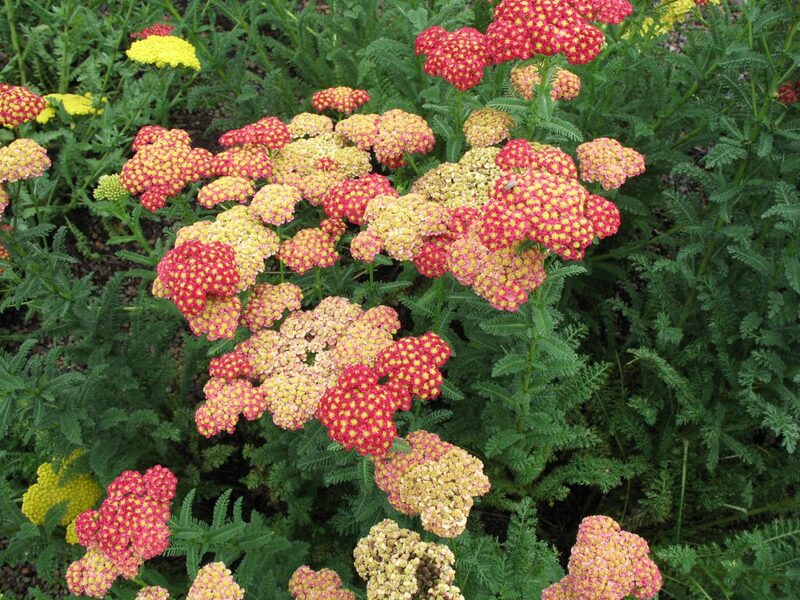 It prefers moist well drained soils, but is also drought tolerant. This is a favorite fall blooming perennial and is a native. 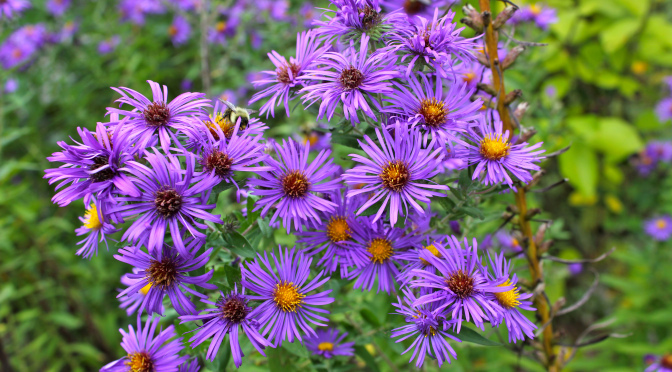 The dark purple – vibrant dark pink bloom colors are welcomed this time of year, as many fall blooming plants tend to be more yellows to reds. This is a pretty problem free easy to grow perennial that will provide the garden with some color from late August until October. This is a native wildflower that comes in colors that range from yellow, orange to red. Several varieties that are made up of more than one of these vibrant colors. This perennial blooms from July to late September and should be deadheded to promote longer blooms. This is an low maintenance native perennial. Blooming from July to late September into October, you will certainly get bang for your buck with the vibrant gold color of this plant. 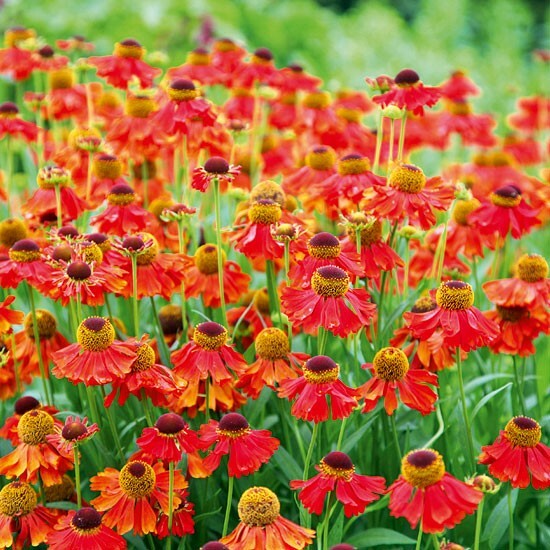 There are several varieties of this perennial with varying heights, so you can choose the one that is appropriate for your growing space. 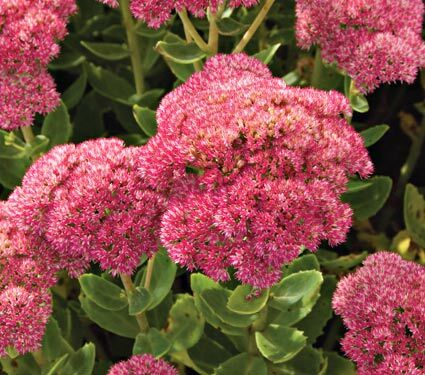 Like all Sedums it is draught tolerant and prefers to be planted in full sun. This variety is known for it’s fall color and has small clusters of flowers of dark pink flowers in September and October. 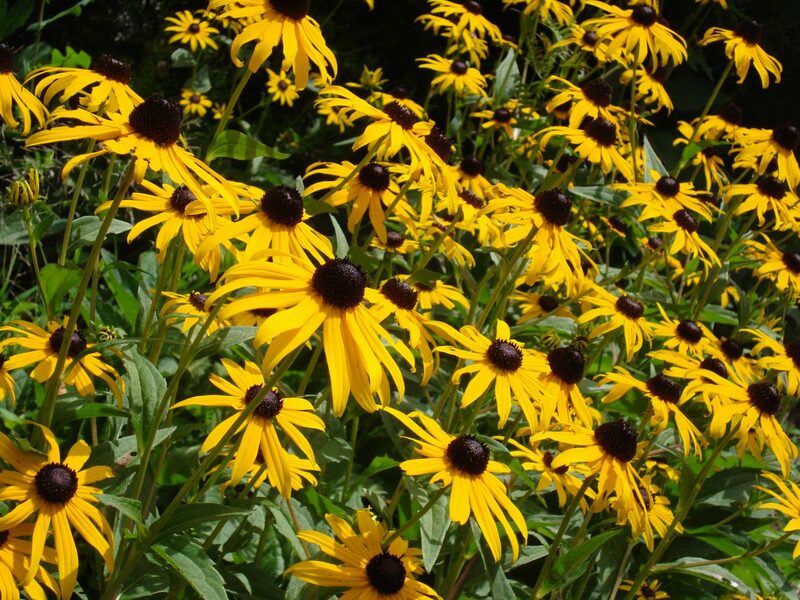 This perennial will outlast most of the other herbaceous plants you have in your garden, and will still look great well into the late fall. There is nothing like the smell of fresh cut grass on a summer day. My family laughs at me for having “Fresh Green Grass” and “Riding Lawn Mower” candles burning throughout my house year round. I love the smell and the happy summer memories that smell brings to mind. Lawns are an integral part of all residential and commercial landscapes in Vermont. They make up a major portion of most landscape designs, as they have different importance to different people. Some of our clients like seeing a large spreading lawn, giving a clear view to their homes / view or providing open space for play. Others want the smallest amount of lawn possible as they feel that lawn maintenance is a waste of time and not a sustainable practice. Whether you have a large or small lawn, it needs to be taken care of properly to thrive. With the right mowing, fertilizing, watering and aerating you can have a beautiful healthy lawn. If you need help with maintianing your lawn please contact us through our website or at (802) 279-5900. We would be glad to help! For some general information on lawn care, check out the University of Vermont’s Extension Service Lake Friendly Lawn Guide or keep reading! Always remember to keep mowing blades sharp. Keeping the blades sharp will ensure that you are cutting the grass cleanly and not tearing the blades of your grass. This will aid in the health of the lawn. The mowing height will vary by the time of year, the growing conditions and the type of grass you have. With the correct mowing height your lawn will need less maintenance and be more drought tolerant. Most Vermont lawns are comprised of a mix of Fine Fescue and Kentucky Blue Grass. The recommended mowing height for these types of grasses is between 1.5”-2.5”. If mowing in a shady portion of the yard, you should keep the grass a bit higher as the grass is apt to grow better. Try not to mow when the lawn is wet, as this is more apt to tear the grass blades and the tires of the mower could damage the lawn. In general you should mulch the lawn clippings back into the lawn, as this helps to restore nutrients to your lawn. If you choose to use a bagger attachment on your mower, the clippings should be composted. When mowing, a striping pattern will give your lawn the nicest overall appearance. This is performed by mowing in straight lines and over lapping the lines by a tire width. Stripe direction should be changed each time you mow. For more information on mowing, visit Safelawns.org. There are many schools of thought and many companies that specialize in lawn fertilization. This practice will help to promote healthy root systems, which will in turn help your lawn be able to withstand cold, heat, mowing, foot traffic and many other stresses. In most cases it is recommended that you feed your lawn in the spring and fall. But even just one application a year will aid the health of your lawn tremendously. For more information you can check out either Scotts or Natural lawn of America. Watering needs will vary depending on your location and the type of grasses that make up your lawn. In most cases Vermont lawns need about 1” to 1.5” of water per week through natural rainfall or irrigation. It is better to water your lawn a few times a week for extended periods of time, rather than just a light watering every day. You want to make sure that the roots are getting a good soaking. The best time to water any plantings, whether they are lawns, trees or gardens is in the early morning or in the evening, as less evaporation will occur. Aeration is completed to help allow water and air to reach the roots and penetrate through the built up thatch of the lawn, as wellas relieve some soil compaction. There are two types of aerators that can be used. One is a spike aerator and the other is a plug aerator. One has spikes that simply poke holes into the soil of your lawn and the other actually removes tiny plugs of grass and soil. Best results are seen from the plug type aerators. This should be completed during the growing season, so your lawn can recover from the process. Click here for more information on aerating. Dethatching your lawn is often an over looked process that really makes an impact on the health of your lawn. Thatch is simply a layer of dead grass that gets built up over time and eventually hinders water and nutrients from reaching the soil beneath. Once the thatch layer becomes about a ½”, it is time to remove it. This can be done by hand or there are dethatching machines that can be purchased or rented. Lawns should not be dethatched during the early spring as the grass of your lawn is tenderer when coming out of dormancy. Click here for more information on dethatching.